Brittany has done the hairstyling for many of our veneer photo shoots. She saw first hand the many happy patients that had their smiles transformed and approached us with helping with her own smile. 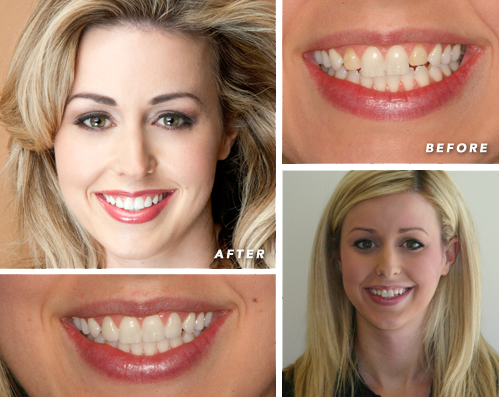 She did not care for the two dark yellow lateral incisors in her smile but was pleased with the rest of her smile. Brittany is a beautiful young lady and we were happy to help her with her concerns. She is missing her lateral incisors and had short, yellow, primary lateral incisors with discolored bonding in their place. She exhibited slight asymmetry with her central incisors, missing canines, but overall a naturally pleasing smile. Brittany's treatment plan was very simple and was completed quickly. She was already beautiful but now her smile makes her radiant. Dr. Gombert has given me the confidence to smile. I met Dr. Gombert a few short years ago and brought my concern to his attention. For reasons unknown to me, I never lost two of my baby teeth. As an adult I found the discoloration and development of my adult teeth next to the baby teeth to take away the confidence of a beautiful smile. Without hesitation, Dr. Gombert provided me with answers to my questions and solutions for a brighter smile. To say I am thrilled with my new smile is an understatement. Thank you Dr. Gombert and Parkside Dental Health.